Egyptian Court Sentences U.S. Citizen To Life In Prison : The Two-Way Mohamed Soltan, 27, was among 36 defendants sentenced to life in prison. Fourteen others, including the leader of the outlawed Muslim Brotherhood, received death sentences. 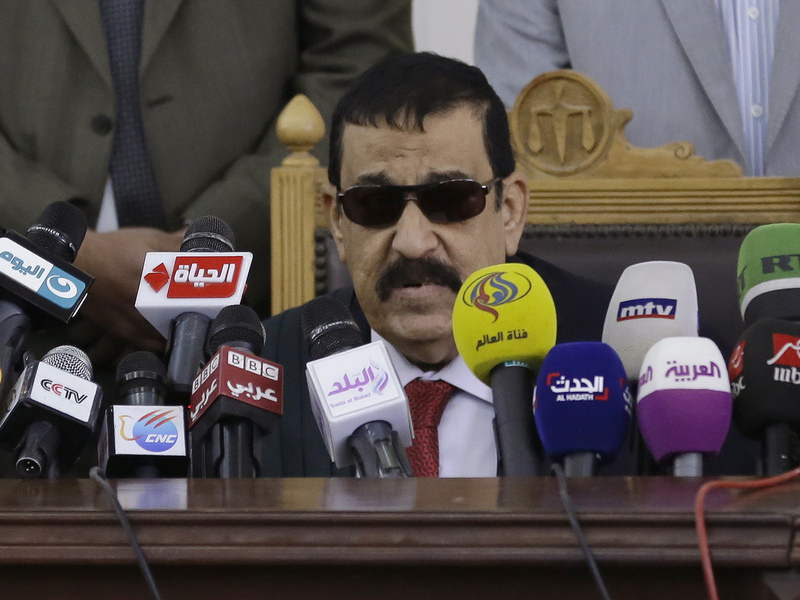 Egyptian Judge Mohammed Nagi Shehata reads the verdicts against Mohammed Soltan and others charged with ties to the Muslim Brotherhood in Cairo on Saturday. An Egyptian court has sentenced an American, Mohamed Soltan, to life in prison for having ties to the outlawed Muslim Brotherhood, as the court also handed down a fourth death sentence on the leader of the Islamist group that was ousted from power in a 2013 coup. Soltan, 27, a graduate of Ohio State University, "was arrested in 2013 after Egyptian security forces stormed a sit-in protest of supporters of ousted President Mohammed Morsi. Soltan was shot during the violent break-up of the protest, and was taken into custody along with his father, who was an active political opposition figure within the Muslim Brotherhood," according to NBC News. The verdicts, read on Egyptian television, can be appealed. Three of those who received life sentences were journalists, according to the Committee to Protect Journalists. NPR's Leila Fadel, reporting from Cairo, says that in a leaked video from prison last year, Soltan pleaded for President Obama's help. "If I'm still alive then I ask my government. The government of the United States of America, is my life not worth anything to you?" Soltan is heard saying in the video. For more than a year, he has been on a hunger strike, Leila says. Meanwhile, Muslim Brotherhood leader Mohamed Badie and 13 of the group's senior officials were sentenced to death for inciting chaos and violence. For Badie, it was the fourth death sentence he's received in a web of tangled court cases. All but one of the previous three were subsequently overturned. Reuters notes: "Egypt's mass trials of Brotherhood members and people accused of links to the group, as well as its tough crackdown on Islamist and liberal opposition alike, have drawn international criticism of its judicial system and human rights record."